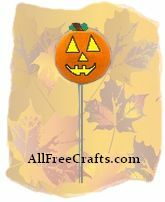 Here’s a homemade Halloween decoration that you can make to decorate your radio or car antenna. These lightweight Jack-O-Lantern balls also look great suspended from the ceiling, arranged in a fruit bowl, or placed wherever a small pumpkin craft would look good. 1. Poke a hole in the ball with a pencil. Use the pencil to support the ball while you are painting it with orange paint. Place the ball, on the pencil, inside a small vase or other support to let the paint dry. 2. Paint on a Jack-O-Lantern face. Draw the outline in pencil first, until you like the design, then go over it with black paint or permanent marker. Color in with the yellow paint marker or acrylic yellow paint and let the paint dry. 3. Use a spray or paint on sealer to seal the paint all over the ball. 4. Cut one or two small leaf shapes from green fun foam, and a small rectangle of brown fun foam to use as the stem. 5. Poke two or three small holes at the top of the ball with the pencil. 6. Dip the fun foam leaves and stem in craft glue, or use a small drop of hot glue, then poke the leaves and stem into the holes at the top of the ball. 7. You may need to make the hole at the bottom of the ball a little bigger to attach to your radio or car antenna. If the ball doesn’t seem secure, put a small amount of white craft glue (or other water soluble glue) in the hole before placing it back on the antenna. Hold the antenna still and twist the ball sharply to remove. » If you wish to suspend the Jack-O-Lantern ball from the ceiling, glue a length of string or invisible thread into one of the holes before inserting the fun foam. » Glue on some strands of straw or raffia, and a straw hat, to make a scarecrow head. Paint the head a staw color instead of orange and use scarecrow features instead of the Jack-O-Lantern face.